Two Exercisers in one! 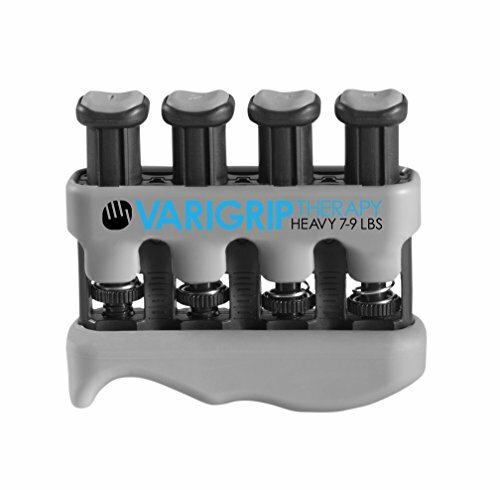 Only VariGrip Therapy includes the patented adjustable tension, providing customized tension for each individual finger, thus improving circulation, dexterity, endurance and strength more effectively, and creating a smoother transition from one resistance level to the next. VariGrip Therapy is not only for fingers and hands, but also for conditioning the wrist, and forearm. Instead of a fixed tension level for each finger, VariGrip Therapy allows the user the ability to adjust tension for each individual finger, and customize hand/finger therapy to focus on progress. Adjust tension as needed. Simply turn the dial at the base of the unit to the left to increase resistance, or to the right to decrease resistance. Ergonomic, extra-wide base disperses pressure more evenly than other exercisers, and is far more comfortable. Special lip design inside base provides more stability than other exercisers. Includes full set of multi-lingual exercise instructions, including 3 thumb specific exercises, and fine motor skill exercise. If you have any questions about this product by VariGrip, contact us by completing and submitting the form below. If you are looking for a specif part number, please include it with your message.